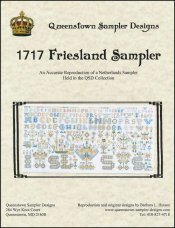 1717 Friesland Sampler [D5604] - $28.00 : Yarn Tree, Your wholesale source for cross stitch supplies. Cross stitch chart from Queenstown Sampler Designs. This design sampler is from northern Netherlands, west of Groningen. Charming motifs burst across this design. The linen chest was an important household item. Some motifs are just for fun, like children jumping rope, while others are symbolic. The feather Tree of Knowledge has the date 1717 inscribed. Four-sided motifs with birds symbolized the universal four elements: earth, air, fire & water. The most unique motif on this sampler is the horse drawn, caged wagon. Stitch count 248 tall x 531 wide.